Ghee is greatly revered in the Indian culture and has been used in the medical science of Ayurveda for thousands of years. This very versatile substance may be used internally as food and as medicine; or used externally as a skin moisturizer. Ghee is commonly used as an offering in puja (holy Hindu ceremony) and homa (fire ceremony). Ghee is an important factor in Ayurvedic cleansing therapies, while also being highly beneficial during rejuvenation therapy. So what is ghee exactly? Ghee is sometimes referred to as clarified butter since the milk solid have been “cleared” from it. Once these milk solids are removed from the butter, you are left with a beautiful golden oily substance. Once made, ghee contains practically no lactose or casein, making it suitable for people that cannot normally digest dairy. Many chefs prefer ghee over butter as well, since the smoke point of ghee is much higher, at about 450 degrees. Ghee can be used as a butter or oil substitute, and can be utilized in a wide variety of dishes. A large component of the health benefits of ghee are derived from the short-chain fatty acid, known as butyrate acid, which is present in ghee. As you will discover below, this vital fatty acid has been clinically proven to increase energy, heal the colon wall, prevent colon cancer and reduce autoimmune conditions, among other benefits. 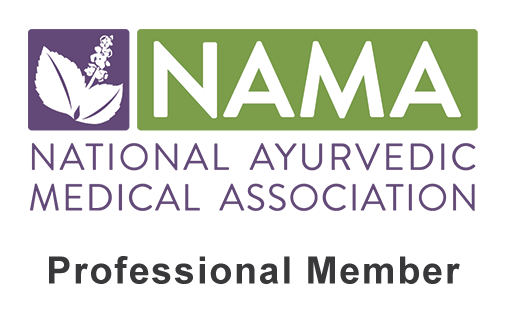 Although western science is just now discovering the numerous benefits of this nutrient, these healing properties have been well-known information among Ayurvedic doctors for thousands of years. Purchase handcrafted Organic Ghee here. Ghee is not only versatile in use, but versatile in health properties as well. 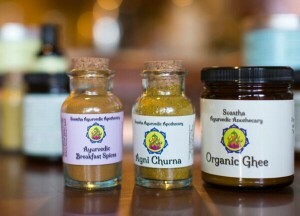 Here are some of the most well-known reasons ghee is thought of as a holy medicine in Ayurveda. Possibly the most well-known health property of ghee is the fact that it is an amazing agent for enhancing the digestive fire (Agni). Ghee stimulates the secretion of stomach acids and in turn increases our ability to break down food. Ghee also removes toxins and promotes elimination, both of which will help to increase one’s overall digestive capacity. 2. Enhances the absorption of nutrients. Ghee not only helps to break down food matter, but also increase the ability of the intestinal wall to absorb vital nutrients. Since most individuals have a deficiency of these fundamental nutrients, this is essential in increases one’s health and wellness. 3. Enhances the healing properties of herbs. In Ayurvedic medicine, ghee goes way beyond a dietary ingredient. Ghee is a well know catalystic agent (anupana), which has the ability to drive the healing properties of the herbs down into the deep tissues. This in turn will enhance their effectiveness and healing potency. 4. Increases vital Ojas in the body. Ojas is the subtle energetic force that is responsible for one’s energy, vitality and immunity. A person with healthy Ojas is soft, gentle, compassionate and patient. Ojas is also responsible for a healthy luster of the skin as well as a strong, healthy libido. Ghee will enhance all of these qualities when taken consistently in proper proportions. Read more ways to increase Ojas here. 5. Heals the intestinal wall. Ghee is one of the highest sources of butyrate acid, a short-chain fatty acid. This healthy fatty acid is vital in the health of the intestinal wall, as it nourishes, heals and reduces inflammation of the gut wall making it ideal for disorders such as “leaky gut syndrome”, IBS, Crohn’s disease and ulcerative colitis. Butyrate acid is balancing to the gut flora and is beneficial for reducing Candida overgrowth and other unwanted pathogens. 6. Reduces the risk of colon cancer. Butyrate acid has been proven to be preventative to colon cancer, as it increases the healthy bacteria in the colon, removes the unhealthy and is responsible for the growth and regulation of colon cells. Ghee in general aids in healthy elimination as well. These are all components for optimal colon health. 7. Lubricates the body, externally and internally. 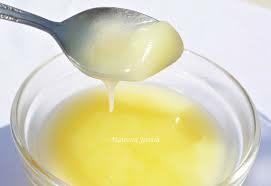 Ghee is a well-known treatment in Ayurveda for relieving dryness in the body, as it is oily and moisturizing by nature. Whether taken internally or applied externally, ghee has the ability to nourish and lubricate the tissues on a cellular level. This reduces dry skin, dry colon (constipation), inflammation and stiff joints while increasing luster, flexibility and promoting healthy elimination. 8. Promotes the elimination of toxins stored in the body. Ghee is traditionally used to remove deep-rooted physical and mental toxins during an Ayurvedic cleanse. It is a vital step in the preparatory phase (purva karma) of the cleanse, as well as during the cleanse itself. By taking ghee in large doses prior to the cleanse, it “loosens” the deep-rooted toxins from the tissues which allows them to be eliminated through purgation, etc. Without this, the removal of toxins will only be on a superficial level. 9. Essential for rejuvenation therapy. Although ghee is used to aid in cleansing, it is just as vital for the rebuilding and regeneration of the tissues as well. In times of depletion, weakness and debility (including after a cleanse or illness), ghee is an amazing medicine for increasing energy, strength, immunity, vitality and stamina. Ghee can be mixed with rejuvenating herbs, mixed with honey or simply added to each meal. 10. Nourishes the brain and nervous system. Ghee is known as a “medhya” substance as it increases mental reception, intellect and memory. It is beneficial for mental and emotional imbalances, as well as a depleted, sensitive nervous system. Since fat is needed in order to break the blood/brain barrier, taking brain nourishing herbs along with the ghee will only enhance these mentally boosting benefits. Ghee possesses powerful anti-inflammatory agents making this a necessary medicine for allergies, arthritis and autoimmune conditions. Chronic inflammation can cause premature aging, pain, swelling, burning, stagnation and irritation. When left untreated, inflammation soon leads to destructive disorders such as cardiovascular disease, cancer, diabetes and autoimmune conditions. If you are new to the idea of ghee, you may be wondering how to incorporate this Ayurvedic superfood into your daily life. Fortunately, this is an easy question to answer, as the uses for ghee are endless. In the most simple context, ghee can be used as a replacement to butter or oil in any dish. However, it can also be used as medicine when done appropriately. Here are some examples of how to take ghee for a variety of different uses. Ghee can be added to any meal to promote digestion and increase the absorption of nutrients. For this purpose, one should add 1/2 to 1 tsp to each meal. Purchase our handcrafted ghee here. Melt 1 tsp of ghee in warm water each morning and take on an empty stomach upon awakening. For stronger results it is suggested to take a cleansing medicated ghee such as Titka Ghrita or Triphala Ghrita. Purchase our Tikta Ghrita here. For severe constipation issues, melt 1 tsp of ghee in warm water and add in 1 tsp of Triphala Churna. Steep for 2-3 minutes and stir well before taking. Take each night before bed. For mild cases of constipation, take 1-2 tsp of ghee melted in a cup of warm milk before bed. This method is also recommended for constipation during pregnancy. Ghee can be added to an herbal formula to increase the absorbency and effectiveness of the herbs. For even greater potency, the ghee can be infused with the herbs to make a medicated ghee. 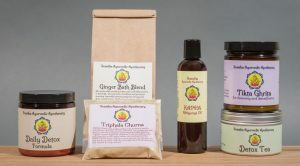 Check out our line of medicated ghee here. Mix 1 tsp of honey with 1 tsp of ghee and wash down with warm water. Take this each day around 2-3pm for a mid-day pick-me-up, or take as needed. For even better results, one should use an energizing medicated ghee such as Rasayana Ghrita (aka Rejuvenation Ghee) instead of plain ghee.